I read this article and found it very interesting, thought it might be something for you. The article is called Latest news from the Campaign Manager and is located at https://votesocialism.com/latest-news-from-the-campaign-manager/. It was another fun week as we steam along towards election day. Here’s how this week went and what’s coming up. Speaking of steam, Steve got heated last week after the Senate passed the VA MISSION Act 92 to 5. Both Washington State Democratic Senators, Maria Cantwell and Patty Murray, voted yes for this bill that will open the door to privatization and give new authority to a corporate-led board. Steve exposed the dangers behind this bill in a new statement, “Congress Abandons Veterans Just Before Memorial Day.”The campaign submitted the article as an op-ed to the Seattle Times but had no luck with breaking the Seattle press blackout. Later in the week we submitted to the Spokesman-Review and hopefully they will publish it. If and when they do, we will share links and put it on our website. In the meantime, we recorded a short 4-minute video of Steve explaining the problems with the VA MISSION Act. Watch it here. 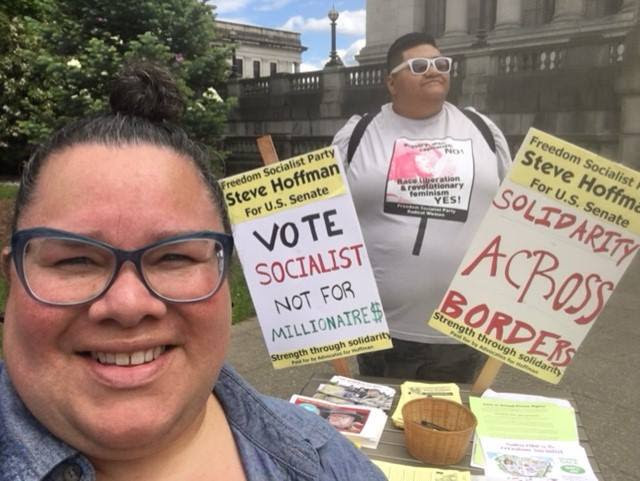 Supporters from Los Angeles, Karla and Yuisa, spent some time in the Seattle area and included volunteering on the campaign in their schedules. Karla called, edited videos, and recorded Steve talking about the VA MISSION Act mentioned above. Yuisa called, wrote answers to questionnaires, made buttons, picket signs, and more. Both had a grand time campaigning with Steve in Olympia on Monday. Come visit anytime! Seattle Radical Women and several other groups are planning a defense of the Kent Planned Parenthood clinic on Saturday, June 9th. “Defend Women’s Reproductive Freedom: Say NO to misogynists” is in response to Patriot Prayer and Joey Gibson for U.S. Senate’s “Defund Planned Parenthood” event. Steve endorses this protest and encourages all supporters to attend. Details on the Facebook event here. 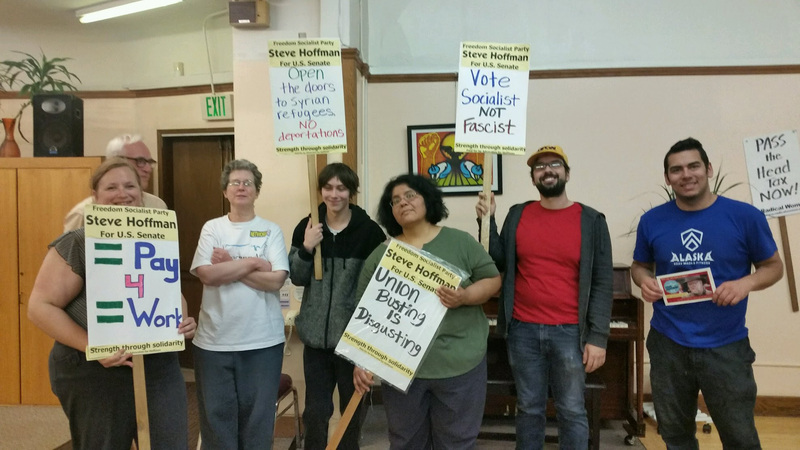 Seattle Radical Women is a proud supporter of the Hoffman campaign. Read why here. On Saturday Steve will campaign with volunteers at Burien Pride. Are you an early bird? On Monday morning, 6:40 a.m. to be exact, Steve will be part of a call-in radio interview with KXRO, Aberdeen. You can listen live on their website. Steve’s next speaking gig is in Mt. Vernon, where he’ll chat with a Washington Federation of State Employees (WFSE) local about his campaign. Aid of all sorts is coming in and it’s great! We had office help, campaigners in Olympia, Capitol Hill, Bellingham, Rainier Beach, Renton, Queen Anne and beyond, yard sign takers, social media mavens and mailing aces. You too could be a postcard purveyor, a yard sign dispenser, office-help provider or Hoffman Campaign assistant in some other way. Call 206-722-2453 or drop by Campaign HQs at 5018 Rainier Ave. S., Seattle. And there’s always Volunteer Nights on Wednesdays! To request a yard sign, call or fill out this handy, dandy Yard Sign Request form. With a working-class candidate running a people-powered campaign, every dollar helps promote the demands of workers in this sea of corporate spin. Make checks payable to Advocates for Hoffman and mail to 5018 Rainier Ave. S., Seattle, WA 98118. Or donate online. My last thought for the week is about the Freedom Socialist newspaper. Not only is it doing a great job covering the Hoffman Senate race, but it combines a “tell-it-like-it-is” mentality with the optimism of people standing up and fighting back. During the month of June, subscriptions at 50% off—only $5. Subscribe or renew your subscription here and save!